Ok, so this is NOT the Saint Louis IPA. This is not S-T-L-I-P-A, where you pronounce all of the letters individually. This is STLIPA, pronounced sta-leep-a. I want to make sure when you go to order it you don't look like an idiot, because I promise you're gonna be ordering this Double IPA from Urban Chestnut out of St. Louis. The first time I had this beer I was at St. Elmo's downtown. They had it on tap and at the time I just thought it was an IPA, so I had a few. A few turned into a lot more than that and the night got away from me. Be careful, this is a big boy beer. 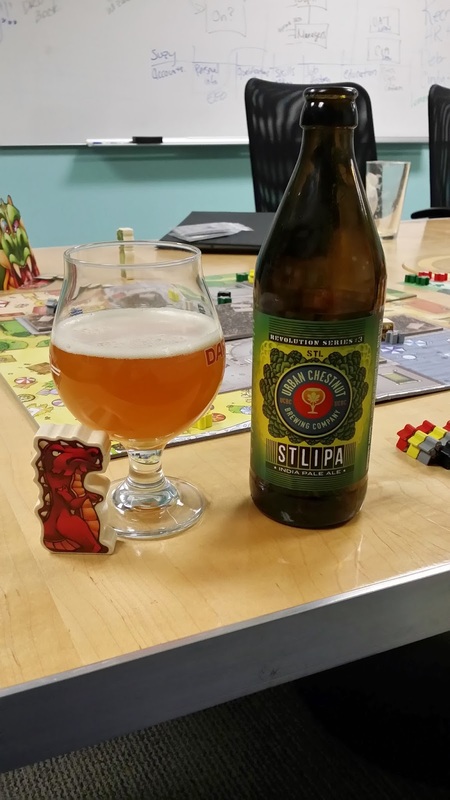 STLIPA is a deceiving DIPA with 8% abv and a surprisingly low 55 IBUs. It pours out a nice light orange color with a big fluffy white head, that fades to really sticky lacing. It smells like resiny pine and citrus fruits, but the aroma is pretty subdued. The very bright aroma matches the flavor spot on. This beer has a ton of big hop flavor right up front. Primarily you'll taste grapefruit and other less distinct citrus fruits and a little piney resin. That's followed up by a biscuity malt flavor that blends nicely with the hops. Finally, there's a big resin bitterness with just a bit of onion hop sharpness. This complex hop bill does a great job of covering up all of the alcohol in this beer. It's big, sweet and hoppy but there really isn't much boozy heat at all, which is what makes it dangerous. This seems to be Urban Chestnut's biggest mover here in Indy. I had it at Twenty Tap on tap and out of the bottle later this week. It was better on tap, but I don't know how old the bottle was. I really hope we start seeing a bunch more of this one around town, because bang for your buck its a hell of a beer! I have only had Urban Chestnut's STLIPA from the bottle (received from the same place as The Big Guy's), so a fresher batch would likely change my impression for the better. The fruity citrus blended well with the maltiness, but the STLIPA was much less aggressive than I expect from a DIPA. The STLIPA does a very good job of hiding its ABV, with essentially no boozy heat.